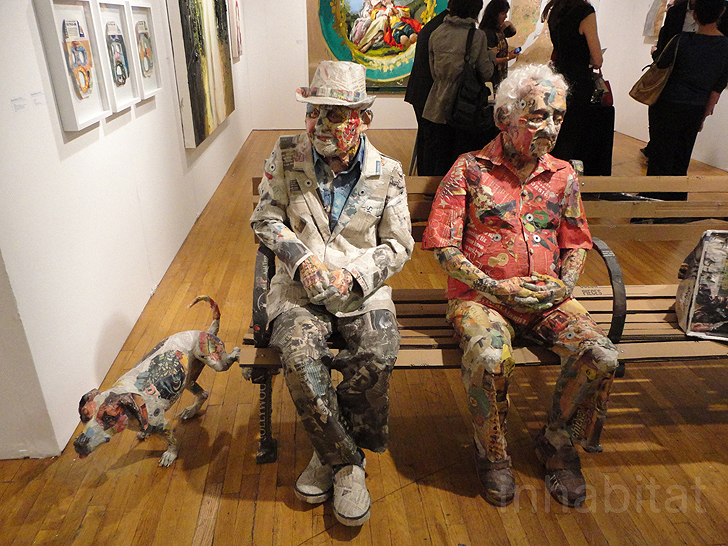 We first took notice of artist Will Kurtz’s incredible newspaper sculptures at this past PULSE New York Art Fair. 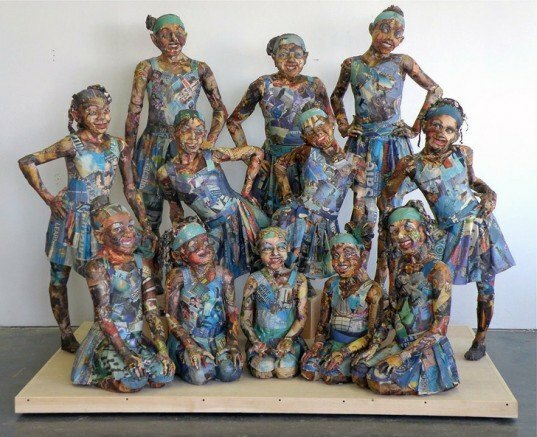 The artist transforms crumpled and colorful newspapers into life-size sculptures of men and women of all ages, as well as dogs. Despite their colorful and textured appearance, Kurtz’s pieces are eerily realistic, and they often portray subjects on the fringes of society. Kurtz’s characters feature the same physical imperfections that real people do — hanging jowls, rolls of fat, bags under their eyes — only these common disfigurements are not clad in skin, but instead with the colorful pattern of used newsprint and magazines. Occasionally, the artist uses what is printed on the pages he uses as his medium, projecting the scandalous headlines, gloomy news and tabloidized faces of celebrities onto the surface of each character. Many of Kurtz’s characters are inspired by people he sees around New York. But he uses sculptures made of recycled materials to draw attention to many of the characters we tend to avoid. The artist has often created sculptures of wilted homeless people, crumpled in uncomfortable slumber, as well as panhandlers, with and without amputated limbs. Kurtz also tends to depict the obese, layering more and more newspaper to show the paunch of a beer belly or bulge of a waist line. Using a newspaper layering process, Kurtz binds his subjects to the texts he wraps their “skins” in. By creating skins of yesterday’s news, the artist further punctuates his choice of sculpting the underlings of society. Kurtz’s characters suffer from the everyday ailments that people do- hanging jowells, rolls of fat, and bags under their eyes. Only these common disfigurments are not clad in skin, but instead with the colorful pattern of used newsprint and magazines. Occasionally, the artist utilizes what is printed on the pages he uses as his medium, highlighting scandalous headlines, tabloidized faces of celebrities and gloomy news on the surfaces of each character. Many of Kurtz’s characters are inspired by people he sees around New York. But he uses his recycled sculptures to draw attention to many of the characters we tend to avoid. The artist has often creates sculptures of wilted homeless people, crumpled in uncomfortable slumber, as well as panhandlers, with and without amputated limbs, and fighting dogs. Kurtz also tends to depict the obese, layering more and more newspaper to show the paunch of a beer belly or bulge of a waist line. Using a newspaper layering process, Kurtz binds his subjects to the texts he wraps their “skins” in. By creating skins of yesterday's news, the artist further punctuates his choice of sculpting the underlings of society.